The evolving political and regulatory climes in recent times pose several challenges to hospital medicine. There is a need for a “consumer‐driven” approach to health care that emphasizes both quality of care and consumer satisfaction (Richardson et al., 2001). Several studies have demonstrated better clinical outcomes with a patient‐centered model, including decreased length of stay (LOS), ER visits, and readmissions and higher patient retention rates. In these studies, multidisciplinary teams (MDTs) focus on improved communication with patients, actively involving families/ patients in decision making, and conflict resolution. As part of a Six‐Sigma initiative, Virtua Memorial Hospital in New Jersey launched a care coordination (CC) model of geographic rounding that was initiated in February 2010. The pilot was initially deployed on the infectious disease (ID) unit that had a high level of patient/staff dissatisfaction. MDTs consisting of an APN, RNs, physical therapist, case manager, social worker, and pharmacist were led by a dedicated hospitalist who facilitated daily rounds 5 days a week. Patients and families received educational brochures and were encouraged to be a part of daily rounds. Initial goals were a 5% decline in the LOS and 5% improvement in staff and patient satisfaction. 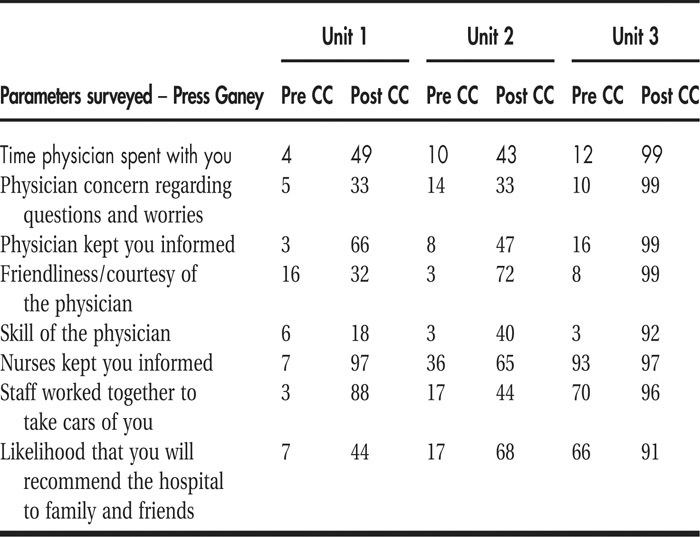 Patient satisfaction was measured using Press Ganey surveys. Long‐term goals include decreased readmission rates and improved patient outcomes. In today's scenario with sensitivity to reimbursements and staffing ratios, the intrinsic value of the CC model lies in its ability to utilize existing resources to deliver consistent, high‐quality, patient‐centered care that is efficient and accountable. Tadi K, Geria V, Abitoye O, Kapoor T. A Care Coordination Model of Unit‐Based Staffing: A Paradigm Shift in Hospital Medicine. Abstract published at Hospital Medicine 2011, May 10-13, Dallas, Texas. Abstract 212. Journal of Hospital Medicine. 2011; 6 (suppl 2). https://www.shmabstracts.com/abstract/a-care-coordination-model-of-unitbased-staffing-a-paradigm-shift-in-hospital-medicine/. Accessed April 21, 2019.